Audiovisual translation can be a precious didactic instrument, encouraging students to question “the values, the symbols, and the shared stereotypes of the culture to which they belong” (De Marco 2011, p. 152). Against the backdrop of studies in second language acquisition with audiovisual tools and with the aid of audiovisual translation in particular, this chapter illustrates the results of a translation test/questionnaire aimed at verifying how MA and BA students respond to the translation for dubbing (English to Italian) of films and TV series featuring characters using words related to homosexuality. 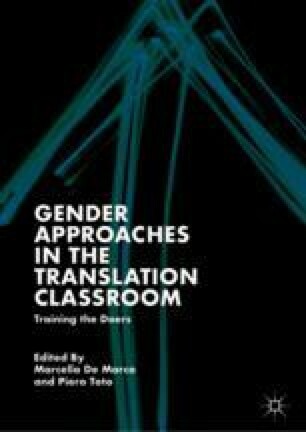 The test has the ultimate aim of enhancing students’ gender-awareness and, more specifically, their awareness of issues related to queer linguistics and the translation of queerness. Herron, Carol, and Matthew Morris. 1995. A Comparison Study of the Effects of Video-Based Versus Text-Based Instruction in the Foreign Language Classroom. The French Review LXVIII (5): 775–795. http://www.gay.it/cultura/news/ecco-il-dizionario-italiano-gergo-gay.